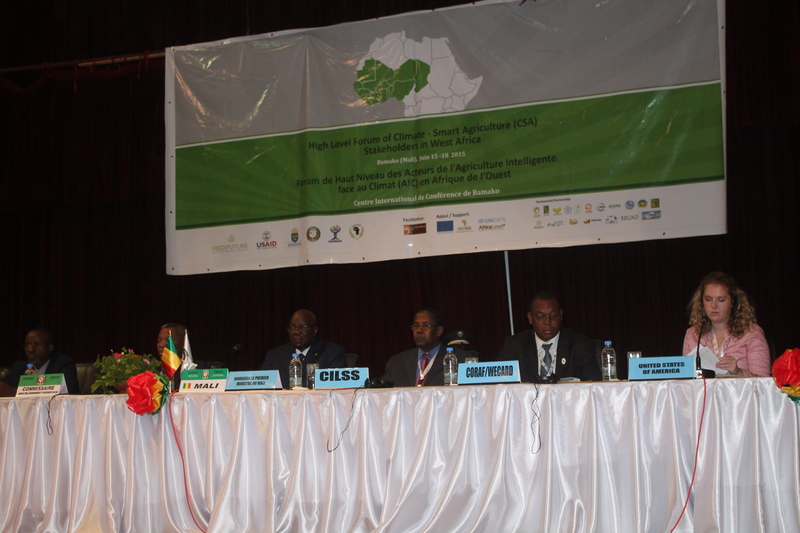 With various CSA regional and national initiatives, ECOWAS, UEMOA and CILSS in collaboration with scientific and technical partners have established an alliance to merge all these tools, models and initiatives, and human resources to a significant impact in the region. Before the launch of the Alliance, experts on CSA issues shared their experiences through presentations in plenary sessions as well as in panel groups and exhibitions. The CORAF/WECARD delegation, composed of ten people led by Dr Abdulai Jalloh, Natural Resources Management Program Manager presented the main results recorded related to CSA. These results were also shared with policymakers during the Opening Ceremony which recorded the speech of President of the CORAF/WECARD Governing Board which was delivered by Dr. Bourema Dembélé, Director of IER Mali. Specific sessions on gender in the CSA on key scientific results and AfricaInteract project were led by CORAF/WECARD. The delegations of the WAAPP Mali, Niger, Burkina Faso and Nigeria have actively participated to sessions and will exploit the key results in the implementation of projects coordinated at national and regional levels. CORAF/WECARD is part of the scientific structures of the West African Alliance on CSA led by ECOWAS, UEMOA and CILSS.